Over the past two decades, book-length analyses of politics in Southeast Asia, like those addressing other parts of the developing world, have focused closely on democratic change, election events, and institution building. But recently, democracy’s fortunes have ebbed in the region. In the Philippines, the progenitor of ‘people power’, democracy has been diminished by electoral cheating and gross human rights violations. In Thailand, though the former Prime Minister, Thaksin Shinawatra, scored successive electoral victories, he so committed executive abuses that he served up the pretext by which royalist elements in the military might mount a coup, one that even gained favour with the new middle class. And in Indonesia, lauded today as the region’s only democracy still standing, the government’s writ over the security forces has remained weak, with military commanders nestling in unaccountable domains, there to conduct their shadowy business dealings. Elsewhere, dominant single parties persist in Malaysia, Singapore, Vietnam, Cambodia, and Laos, while a military junta perpetuates its brutal control over Burma. 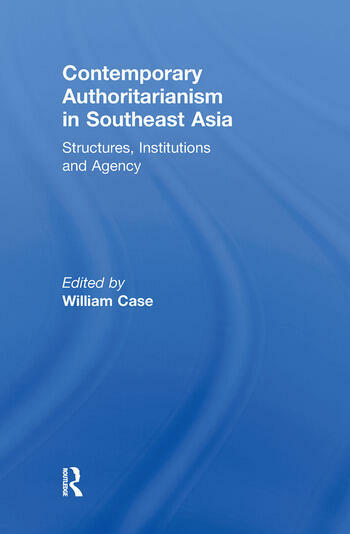 This volume, the first to bring together a series of country cases and comparative narratives about the recent revival of authoritarian rule in Southeast Asia, identifies the structural and voluntarist dynamics that underlie this trend and the institutional patterns that are taking shape. This book was published as a special issue of The Pacific Review. William Case is Director of the Southeast Asia Research Centre (SEARC) and Professor in the Department of Asian and International Studies at the City University of Hong Kong.